Read more Cordless Vacuum Cleaner 1. Power: 110W. 7000Pa suction power, take in dust with great wind pressure. 2. Battery: 2200mAh, last 30 minutes once fully charged, don't have to take the trouble of power cord. 3. Handheld rod can be installed and uninstalled easily, a flat nozzle and ground brush 2 in 1, make it easy to deal with different surfaces. 4. Motorized roller in the brush sweep dust away from floor, and take in with great suction. 5. Transparent washable dust container, easy dust disposal, can be washed under water directly, no consumable materials needed. 6. 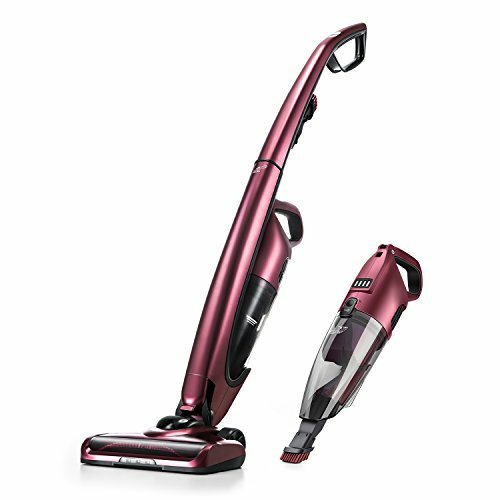 Two different power control button makes cleaning more efficiently, normal power for places not so dirty, and high power for heavy dust area. 7. Stand up and put away directly, easy to store after use, and save space.